"Collins briefed Amazon executives on his seminal management book before its publication. Companies must confront the brutal facts of their business, find out what they are uniquely good at, and master their fly wheel, in which each part of the business reinforces and accelerates the other parts," Stone writes. I’m an avid reader, so it’s hard to pick just one. I really think you need to read everything you can get your hands on — history, biography, fiction, all of it. As an entrepreneur, I think there are some books that you need to read just because they have become such an integral part of the business lexicon, books like Stephen Covey’s 7 Habits and Jim Collins’ Good to Great. I thought I might put my money where my mouth is. I keep whining that young people are not in touch with some essential books on advertising that have helped me shape the way I practise my trade today, but I never did anything about it. So I am starting here the ultimate books to read list. I will add to it as I get suggestions and as more good books get written. As the team grew beyond 7, I noticed that team dynamics came much more into play, and we couldn't assume that everyone knows everything anymore. In addition, I realized that the people we work with affect us immensely. Good to Great helped me to understand how important culture is for building a great, lasting company that has an impact on the world. It started to become clear that we already had a culture, and it was evolving. When I first finished the book, I admit that I still had trouble thinking about how to apply many of the lessons to a company like SEOmoz - with our 7-person team and eclectic industry focus, we would seem to be a far cry from the Krogers, Circuit Citys, Walmarts, and Fannie Maes of the world. But, I did something I rarely ever do - I went back and re-read. I think I've probably read each chapter at least twice in the past 75 days. And, finally, it started to sink in. I wanted to apply these lessons and ask these tough questions about SEOmoz. 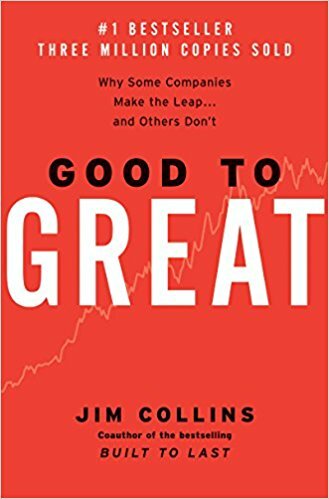 Good to Great: Jim Collins – to learn about the most successful companies and their keys of success. Answer: Here are some others [books] that are important to me. Will assume career path is running a startup, getting clients and managing a team of employees or collaborating with founders. These are some of the best books to cover these areas. It’s hard running a startup, let alone being the person who has to make the highest decisions in the organization. These books help provide the framework in how to run a successful organization but also share some of the stories and pitfalls from other founders so you can avoid making the same mistakes.